I love a good Avengers: Endgame leak. While this concept art, like so many of the others, should be taken with anywhere between an Ant-Man to a Hulk-sized grain of salt, it A) Finally features matching suits for Earth’s Mightiest Heroes and B) May provide the biggest clue yet to the MCU’s worst-kept secret: time travel. Reddit has the quote-unquote ‘scoop’ this time around. In it, there are mock-ups of nine heroes (well, eight heroes and someone else… we’ll get to that) wearing snazzy white, red, and black costumes with an interesting gizmo on their left hands. Take a look. Yep, Black Widow’s costume does look like the worst Photoshop in the history of Photoshops, but there’s reason to believe there’s a kernel of truth in this one. For one thing, it lines up pretty well with a previous Avengers 4 toy leak – which shows Rocket and Thor in the exact same costumes. Plus, Marvel probably just wanted a rough proof of concept. There’s a reason why this was never meant to see the light of day. I’ve done a bit of a 180 on the suits, too. Where before I thought they were nightmare fuel, now I think they look quite… nice isn’t the word I’m looking for. Bearable. That’ll do. So, about those gadgets on their hands. Surely that’s how they can nip to the past, right? The rumours about the team going back in time via the Quantum Realm have been around since just after Avengers: Infinity War released and left us all emotionally scarred and sobbing into the nearest popcorn bucket. This would pretty much confirm it and, yes, Nebula appears to be along for the ride too. After all, she wants Thanos dead just as much as everyone else. If this leak rings true, she’ll be joining Iron Man, Cap, Thor, Hawkeye (yes! ), Ant-Man, Rocket, Hulk, and Black Widow. Avengers 4 has trimmed the fat (thank you very much, The Snappening) and all roads are leading to the past. Now, where’s that Avengers 4 trailer? It's all shaping up to be one helluva end to MCU's Phase Three. 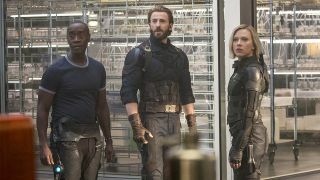 Here's what the cast have had to say about the Avengers: Endgame ending.